One of the greatest joys in a child’s life is when they wake up one winter morning to several inches of fresh snow on the ground and the radio announcing school’s out for a snow day. Parents probably dread those days, but kids love them. The Science Mill, however, has found a way to make it fun and exciting for both kids and parents. Though they can’t finagle a day off from school, museum staff are setting up Saturday, Jan. 19, as an official Snow Day in the Highland Lakes. The Science Mill is hosting its fourth annual event from 10 a.m.-2 p.m. that day. Twenty tons of snow will transform the Science & Art Park, located in the backyard of the facility, into a winter wonderland. 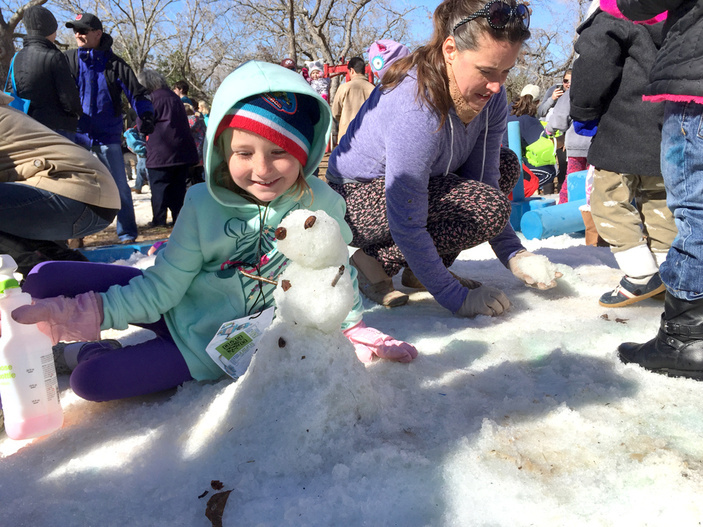 It’s a chance for kids, of all ages, to toss snowballs, make snow angels, and build snowmen. The Science Mill will set up stations where kids can try to hit a moving target with a snowball slingshot, make music with an icicle xylophone, try to outsmart a snow-ball swatting robot, watch an ice sculpture being created, and more. You can even enjoy a cup of hot chocolate or a snow cone as well as a hot dog or taco, which all will be available for purchase. It’s a good idea to bring some mittens or gloves to keep your hands warm while playing in the snow. And since snow is made of water, parents might want to pack a change of clothes for their kids, who are bound to get a little wet. Admission is $11 for adults, $9.50 for ages 3-18, $9 for seniors, $5.50 for military members, and free for ages 0-2. Science Mill members get in free. You can purchase tickets at sciencemill.org or the door. In the case of rain, the event will be postponed. The Science Mill is located at 101 S. Lady Bird Lane in Johnson City. Go to sciencemill.org for more information.